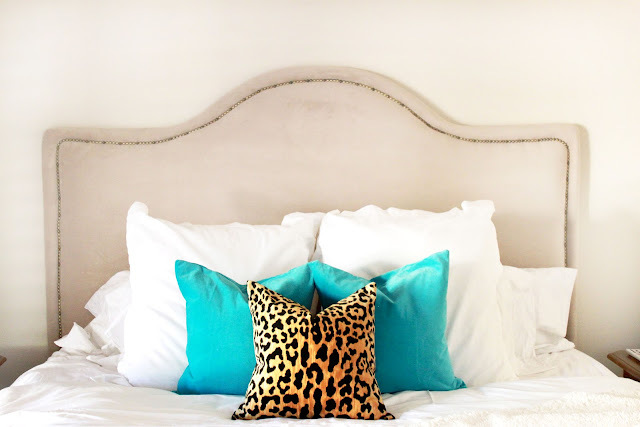 A while back I shared with you that my husband Ryan and I created a custom upholstered headboard for our bed. For today's "tutorial" I thought I would share the idea and process behind it. If you are strapped on budget, want a sophisticated bedroom, and aren't afraid of a little DIY, then making a head board of your own is a fantastic option! I like to give credit where credit is due, so I will not be writing up the full instructions. Rather, for a more in-depth look, visit the fabulous blog that inspired this DIY in our household, Centsational Girl (See tutorial here, and questions answered here). I also watched Design Sponge's informative youtube video, as well as Tiffany Mayer Designs' video, just to get more of a visual before we started. For our particular headboard, I bought the Everyday Velvet fabric by the yard from Pottery Barn. We also used nailhead trim to give the headboard a decorative border. I have to say, it wasn't quite the look I was intending. So, think really hard about what kind of fabric you would like to use, order samples, etc. I'm an impatient type of person, and just ordered a couple of yards hoping it would work out. Which it did, but you know. Fabric of choice that is railroaded (meaning it can be run horizontally) to cover the entire headboard with at least 6 inches to spare on each side. In total, this project cost around $200. I also have to say, my husband really did the brunt of the work. I like to consider us like an HGTV show. I'm the designer and he's like, the handsome carpenter. I drew out on paper the design I wanted, and then drew it onto the headboard as best as I could, trying to work in a little math. Ryan then took to the jigsaw and cut away. The shape wasn't great, and as Ryan pointed out, it looked more like a camaro than a porsche, so I made some corrections on the plywood, and Ryan cut away at it again. Don't be afraid to make a mistake, as you can always readjust. If you don't want the hassle of trying to figure out a design, just utilize the plywood as is. Rectangular headboards are just as nice with ones with a shape. Cut the Plywood with a jigsaw. Cut foam to shape of plywood (we just used scissors). Glue foam to plywood with a spray adhesive. Attach batting to headboard over plywood and foam with a staple gun. 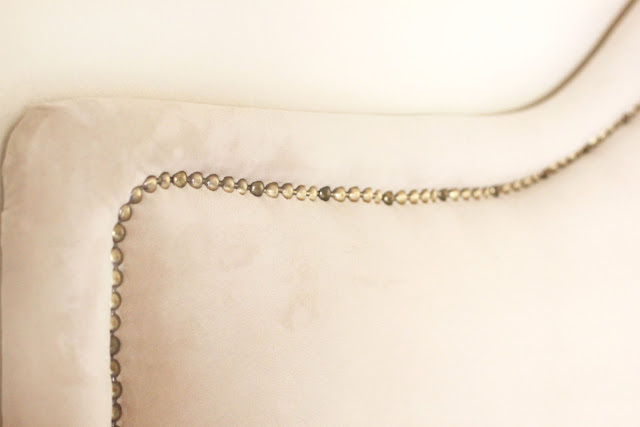 Apply nailhead trim with a rubber mallet. You can also use a hammer. Attach interlocking brackets to back of headboard and to the wall. Sounds pretty simple right? For the most part it is, but it takes some time, and some precision. In the end, you will have a designer looking bed without having to spend designer bucks. Win, win, right? What do you think? Is this something you would be willing to try? This is perfect! I have a headboard in this exact shape that I need to RE-upholste! It's beautiful! And I love your accent colors too. Definitely something I'd love to try! I made our headboard too, with no help from the husband! I think yours looks great; don't be so hard on yourself! katie, that is such a great idea. I dont have a head board but now I want to make one! and I love your little puppy!! I think it turned out amazing! Ive been wanting to do this for so long. I LOVE this.. I've always wanted to do it!! I've been tossing the idea of a DIY headboard around in my head for years...each time I see a tutorial or a story of someone having done it I gain more courage. Thanks for sharing!! I like the nail head trim a lot! Great job! I made one for our guest room. It was a king size, and so cumbersome to work with. However, the end result is similar to the Restoration Hardware Wallace headboard, which costs a pretty penny. The nailhead trim was brutal though - I cut my hands up pretty bad using that stuff! I love it! I made my bedroom headboard too and love that is was a major $ saver. Gorgeous project! I'd love to work on a headboard similar to this. This looks fabulous!!! Well done darling !!! Love it, can't get over the pillows though that is great leopard print with the teal! I love your bedding! Very gender neutral! I'm taking note! it looks awesome, and pooch approved! I think I want to try this! I made one a few months ago! A little different design but it was so fun to make and only cost me about $100! Gorgeous headboard!! I just had to link this to my headboards post too today, well done! Gorgeous project. I very much like simple upholstered headboards in neutral colors to match the rest of the room. I am dieing for a headboard specifically. including. this. In the shade towards nail heads. Zero tall tale. We've Inclusion Instruction appeared that high on metacafe and also saw a lot of course.. I recently never confidence myself personally!! lol Maybe once we get the bedroom painted, We'll speak him engrossed. : ).